If you notice the incorrect time in your PHP scripts, the likely culprit is that the hosting server is in a different timezone. For example, when you're an InMotion web hosting customer, you can select from data centers in Washington, D.C. or California, which means the server's timezone will be either Eastern Standard Time (EST) or Pacific Standard Time (PST). If you want to change that, it's a quick fix. Simply insert a line of code into your php.ini file and the location you set in the code will determine the time to display in your PHP scripts. Keep reading to learn how. Replace "US/Central" with the timezone from here that corresponds to the time you want to display. Once you have entered the desired timezone, click Save Changes to save the file. Now, you can check your phpinfo.php page to verify the change took place. I have changed the timezone ini.php file and its changed there successfully even i tested with phpinfo.php it showing there same as per my chnages. but the time on my website still same as before (wrong time). So, please advice what to do? We are happy to help you troubleshoot further but will need some additional information. How/where is the time displaying on your website? Can you provide a link to the site for us to see the time? Great tutorial. This tutorial was really useful to set timezone. Nice tutorial.This tutorial was really helpful to me on set timezone. I set timezone as asia/kolkata in my server but it showing 4 minutes ahead than actual timezone time,plz help mee. If you made the change in the php.ini file then it's possible that you have another PHP.INI file where the change is not taking precedent. Make sure that the php.ini file with the time zone setting is recursive. Here's an article on how to do this: How to make my php.ini file recursive. If the problem continues, then please let us know. So instead of php.ini, I had to create .user.ini in the cPanel's /public_html/ directory for the date.timezone setting to take effect on my site. ...which also requires your cPanel File Manager Settings be set to Show Hidden Files (dotfiles). I recomend contacting Live Support so they can copy the server's default php.ini file to your account. You can then modify the php.ini as described above. 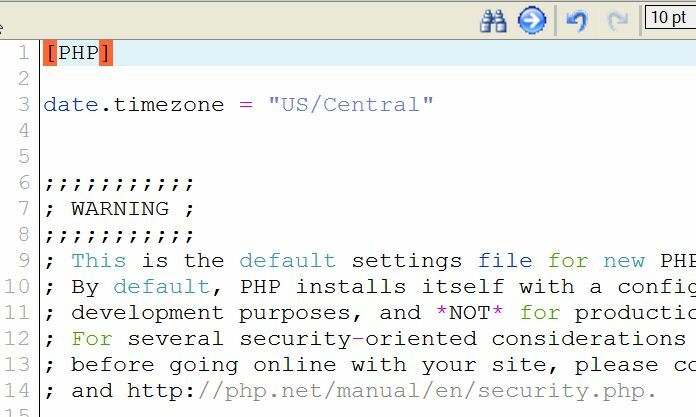 There is no php.ini in any accounts in my reseller account - all sites that check date get the php warning about timezone. The .htaccess fix does not work. Do I need to request a php.ini file created every single time I create a site? This seems excessive. It seems leaving warnings on as a default is a problem. When no default is set, it goes to UTC. This is what I found with one server. For another it was set to Germany/Berlin ! I updated php.ini, but phpinfo() did not update even when pressing F5, until I recycled apache. Then I went into the app and the times were correctly displayed. PHP does not have a timezone specification for Nigeria specifically, but it has one for Lagos. What you are specifically looking for in this case for West Africa, and would be the same no matter where in the world you are is to find out first what your UTC offset is and then use one in the list that matches that. For example, I live in the Pacific Northwest in the USA and our offset is -7 (that is minus seven) and at present we are in Daylight Savings time (aka PDT). When not in DST time of year we are -8 PST. So we are minus seven hours from GMT aka UTC which is at 0 and sometimes expressed +0. Short answer is find your offset and use the one that matches. There are many and I think some with the same UTC offset. I have set date.timezone = "America/New_York" in my php.ini and set it recursive in my .htaccess.. Still getting Los Angeles on my phpinfo page. Thank you for contacting us. Did you add the setting to the top of your php.ini file? Can you provide a link to your site for us to test? THank you,, it worked for me..
GREAT! Now it works with my timezone! Thank you very much! I would like to know how to go back automactically to home page 3 seconds after submitting the data. I'd tried with header but it goes back and forth. Please guide me through that. Thanks a lot for your time. Unfortunately, providing programming support is beyond the scope of our support. Please consult with a developer or forum that helps with programming a solution to meet your needs. I just moved my accounts to IM and am testing. I went to a Members Only login page and got two errors re: php that I am not getting on the old server. I checked the version of php and set it to the same 5.3 that it was using before. You will also want to make sure your php.ini file is recursive. That should solve the issue for you. I use this key in opencart change timezone is succussed. echo "Unable to set timezone. "; // You could send to another var for display elsewhere too. That is if you where using a PHP templating method by which you used the same template page across your entire site. This would go right near the top to be sure to check the setting and change it to the timezone desired. Thank you for your question. Since I could not locate your account with us, here is some background information on the php.ini file. This is from our guide on How to update your local php settings. Only users running on a server with PHP loaded as a "CGI module" will have a php.ini file. The php.ini file by default will be located at public_html/php.ini. If you do not see a file named php.ini in your public_html, please contact our Support Department and request that we create one for you. Thank you for your suggestion. I will review this article and determine if a video would help people set the timezone for PHP in the php.ini. Thank you for contacting us. The above guide explains just that. Were you able to follow the above guide? Did you have trouble with a certain step? I did tried it and it had changed in my php.ini file but whenever I submit the data to my database the time still wasn't changed in my database. thanks a lot for your time. If the times that the data is logged in your DB are according to GMT (example being) then you can do a fairly simple convert according to what UTC offset by adding or subtracting an hour (eg. 3600 seconds per hour if logged using a Unix Timestamp). As for further entries in the DB, I would recommend to use the same method as has been used to this point unless an upgrade is in order. In which case, change relevant data points to match as you desire and and for all previous data, use a conversion script. Some simple logic can be used for this test to create a converter. This will make sure it stays as your script needs it and it is just a change for your script(s) only. Be sure after you have done this to stop apache and restart apache... Well shut down the web server and restart it again so php will pick up the timezone change. Thank you for your comment. But, it is not necessary to restart the server when changing the timezone. You will also not have the ability to do so in a shared servers setting, since it will bring everyone's site down.